1. The Screwfly Solution (1977). "Women have no rights, Don, except what men allow us. Men are more aggressive and powerful, and they run the world. When the next real crisis upsets them, our so-called rights will vanish like—like that smoke. We'll be back where we always were: property. And whatever has gone wrong will be blamed on our freedom, like the fall of Rome was. You'll see." "What women do is survive. We live by ones and twos in the chinks of your world-machine." Last edited by Jun on 2019-03-18 7:34, edited 4 times in total. 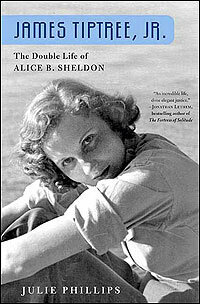 目前正在看 James Tiptree 的传记：The Double Life of Alice B. Sheldon by Julie Phillips. 战前 Alice 也是十分迷惘，第一次婚姻失败，画家事业不够养活自己或者扬名立万，她不知该干什么好，毫无目的地游荡，而且女性的职业机会也十分有限。是战争让她找到意义和工作。让我想起那本书：War is a force that gives us meaning. The big security break came right at the end, when he suddenly began to describe the methods he had used to mutate and redesign a leukemia virus ... He had been explaining that the virus utilized the body’s own immunomechanisms, and so defense was by definition hopeless.